Award-winning Associated Press sports writer Hal Bock brings us a fascinating history of the players, coaches and more barred from baseball's ranks, from Shoeless Joe Jackson to Jenrry Mejia. 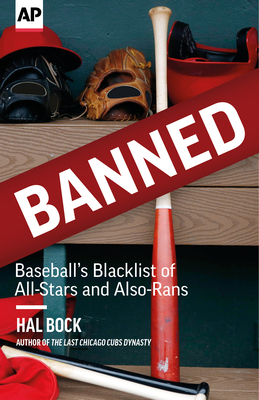 "Banned: Baseball's Blacklist of All-Stars and Also-Rans" weaves together tales of lesser-known characters from baseball's early years with infamous outlaws who have endured throughout the decades. Featuring stories of players like Eddie "The Only" Nolan, Cozy Dolan, Leo Durocher, and Pete Rose who have been expelled or suspended from the sport, Bock's chronicle delves deep into baseball's colorful history. For those who follow the current corporate era of businessmen players and billionaire owners, this book serves as a reminder that America's Pastime evolved from the days when gamblers filled the stands and influenced poorly paid scoundrels on the diamond. In his over 40-year career, Hal Bock has covered every major event on the sports calendar, including 30 World Series, 30 Super Bowls and 11 Olympic Games, making him the perfect storyteller for this retrospective. Featuring an introduction by John Thorn, the Official Historian of Major League Baseball, and more than 25 photographs from the Associated Press archives, "Banned" is a must-read for any fan of the game.